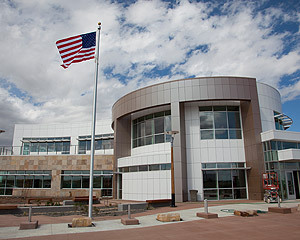 The National Center for Atmospheric Research’s (NCAR) new Supercomputing Center (SC) is located in Cheyenne, Wyoming and houses one of the world’s most powerful supercomputers for use in climate research. The supercomputer, supplied by IBM, named Yellowstone, allows the NCAR SC to operate as designed – to provide advanced computer services to scientists across the nation in a broad range of disciplines including weather, climate, oceanography, air pollution, space weather, computational science, energy production, and carbon sequestration. The NCAR facility is home to a premier data storage and archival facility that holds, among other scientific data, unique historical climate records.